a must-read for all modern bio-scientists and engineers working in the field of biotechnology. Biotechnology Journal, 2012, 7 A cutting-edge guide on the fundamentals, theory, and applications of biomechatronic design principles Biomechatronic Design in Biotechnology presents a complete methodology of biomechatronics, an emerging variant of the mechatronics field that marries biology, electronics, and mechanics to create products where biological and biochemical, technical, human, management-and-goal, and information systems are combined and integrated in order to solve a mission that fulfills a human need. A biomechatronic product includes a biological, mechanical, and electronic part. 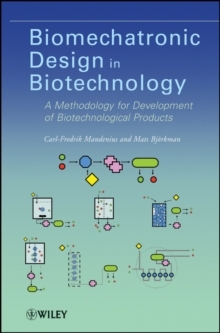 Beginning with an overview of the fundamentals and theory behind biomechatronic technology, this book describes how general engineering design science theory can be applied when designing a technical system where biological species or components are integrated. Some research methods explored include schemes and matrices for analyzing the functionality of the designed products, ranking methods for screening and scoring the best design solutions, and structuring graphical tools for a thorough investigation of the subsystems and sub-functions of products. This insightful guide also: * Discusses tools for creating shorter development times, thereby reducing the need for prototype testing and verification * Presents case study-like examples of the technology used such as a surface plasmon resonance sensor and a robotic cell culturing system for human embryonic stem cells * Provides an interdisciplinary and unifying approach of the many fields of engineering and biotechnology used in biomechatronic design By combining designs between traditional electronic and mechanical subsystems and biological systems, this book demonstrates how biotechnology and bioengineering design can utilize and benefit from commonly used design tools and benefit humanity itself.